Are You Squandering R&D Resources? Are You Squandering R&D Resources? The AIM Institute > Insights > Blog > Competition > Are You Squandering R&D Resources? Are You Squandering R&D Resources? Most industrial companies are. Funny thing is that many large corporations already know they are squandering at least half of their tens-to-hundreds of millions of R&D dollars. (Studies show companies waste 50-75% of their R&D on unsuccessful new products.) They just don’t know which half. Well, they actually do, but not until after the money has been spent. It’s not that the labs are ﬁlled with technical people who can’t ﬁnd the right answers. They’re just being asked the wrong questions. Questions that are unimaginative, being asked at too many other labs and—if solved—create too little value. Questions that are too obvious. These questions fall into two camps: wrong-market questions and wrong-need questions. The former occur when scientists are asked to develop products for market segments that are either unwinnable or not worth winning. This is a terrible waste… an outrage… and the subject of another brieﬁng. For now, let’s consider wrong-need questions and the ensuing footrace. What Footrace Are You In? Does this sound familiar? An important customer tells your sales rep what they want. That starting pistol shot begins the race, and your sales rep quickly drops the request off at R&D’s doorstep, properly packaged and labeled of course. R&D may ask the rep to go back and ask more questions, but once he’s handed the baton to R&D, his leg of the relay is pretty much done. If more than one of you crosses the ﬁnish line, you can forget that price premium. Since the customer is a clever chap, your competitors’ sales reps bring back the identical request to their companies. Terriﬁc. Now you’re all in the same footrace, with the customer waiting at the ﬁnish line. If more than one of you crosses it, you can forget that price premium. What if you ran a different race? This time, you choose the race time and place by targeting an attractive market segment opportunity… which you pursue with in-depth customer interviews. A two-or-three person technical marketing team uses advanced probing to uncover unspoken needs. And since your team knows how to engage the customer in collaborative brainstorming, it will likely bring back unimagined needs as well. The race is on and your competitors don’t even know it. The new product you develop is like nothing the customer has seen before (nor will they for a long time if your patents are in order.) It delivers real value, which the customer shares with you by paying a fair price premium. 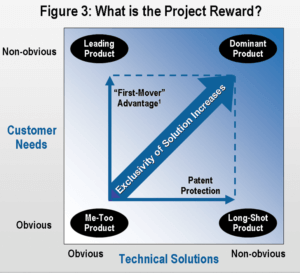 Patents are only granted if they are useful, novel and non-obvious. So we already appreciate the value of non-obvious technical solutions. What about the value of nonobvious customer needs? If you’ll work through the logic with me, you’ll see this value can be enormous.First, imagine your customer has obvious and nonobvious needs and that you can learn about both. 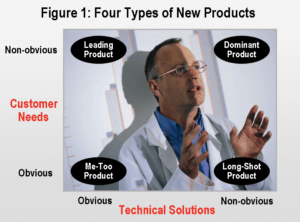 If you could pursue any of the four product types shown in Figure 1—Me-Too, Long-Shot, Leading or Dominant—which would you pursue? 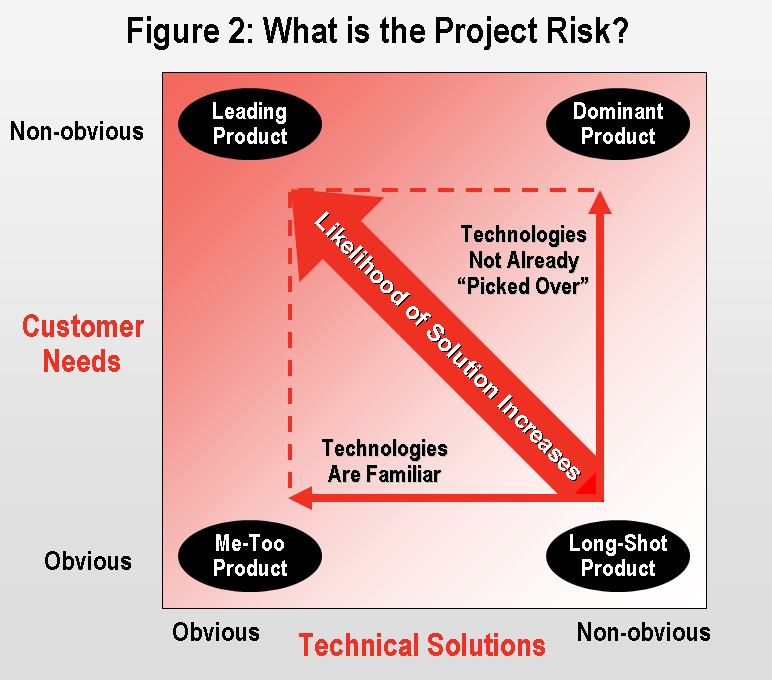 It’s a question of risk and reward where a) risk is driven by the likelihood you’ll ﬁnd a technical solution and b) reward is greatly boosted if you are the exclusive solution supplier. Let’s explore. vector” points left because you’re using familiar technical solutions. But it also points up because you’re trying to answer questions never before asked. The technical solutions haven’t been picked over by others like the bones of a long-dead wildebeest. The reward proﬁle (Figure 3) is driven by whether you are the exclusive supplier of new customer value. You might price your new product to share value 50/50 with your customer. But if a competitor matches your product, nearly all of the value—and your proﬁts–will immediately swing to your customer. Your exclusivity increases as you move to the right, with a solution that is patented. But the “exclusivity vector” also points up, as you are the ﬁrst to discover and satisfy a non-obvious need. You’ll gain ﬁrst-mover advantages— branding, industry reputation, learning-curve experience, industry standard-setting, or even an application patent. Since a project’s attractiveness is a combination of its risk and reward, the vectors should be added together, as in Figure 4. 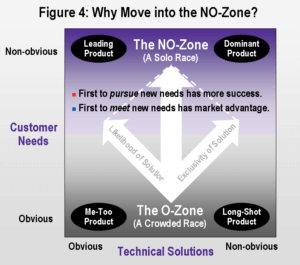 By pursuing non-obvious needs (the NO-Zone), you’ll be the ﬁrst to uncover important needs. This makes it more likely you’ll succeed technically, and gives you ﬁrst-mover market advantages if you do. So Which Projects Should You Pursue? Me-Too: These won’t bring you much value, but some may be needed to ﬁll out your product line. Long-Shot: While these can be a resource sink-hole, they can be worthwhile if you have a likely technical path. Leading Product: Make this your ﬁrst line of attack in most cases. Only move off this if you can’t uncover any non-obvious needs or obvious technical solutions. Dominant Product: These can give you blockbuster value, but don’t start here: What’s the point of a patented solution if competitors can ﬁnd an obvious solution? 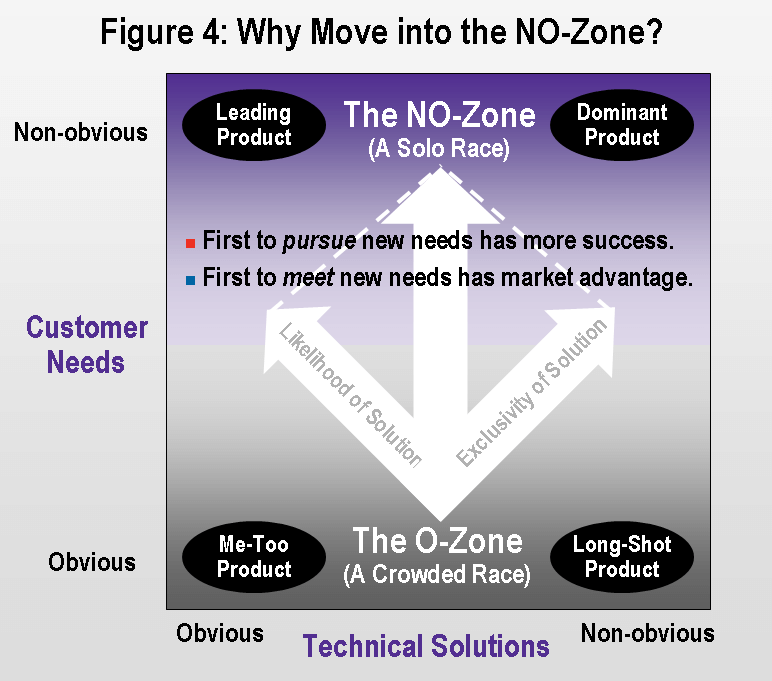 By moving into the NO-Zone you can get much more out of your R&D organization without adding resources. But you will have to shift the workload… by moving work forward and outward: Forward in time by interviewing customers before starting costly product development. And outward by spending more time with customers. The pay-off will be in far greater R&D efﬁciency. Your cost will be a fraction of what you would have wasted. When you do this, you’ll be adding a dimension to your thinking that your competitors lack. They’ll be working on project portfolios in the O-Zone, balancing MeToo and Long-Shot projects, completely missing the dimension of non-obvious needs. They’ll be squandering resources in the zone of lowest possible R&D efﬁciency. Meanwhile, you’ll be competing where your competitors are not… by asking better questions. You’ll be running a footrace by yourself. Now that’s a race you can win. At The AIM Institute, we specialize in helping large industrial companies meet non-obvious customer needs—through training and software. Contact us if you’re interested in training opportunities or a free consultation.